An unending darkness... A world of shadows... A ray of light that found its way... A teacher's dream... A student's miracle... A valiant journey... From ignorance to knowledge... From darkness to light... An extraordinary story of an ordinary life. Based loosely on the real life story of Helen Keller, Black is about Michelle McNally, born deaf and mute. Unable to communicate, she becomes almost feral, until an enigmatic and passionate teacher devotes himself to proving to Michelle the value of her existence. I’ve said several times in the past that I just don’t like musicals. I find the singing to convey emotion fundamentally annoying and the heavily choreographed show numbers turn into just that: a show, not a drama. As such, Bollywood films have largely passed me by. Luckily, Tom put me onto this film precisely because it isn’t a musical. I stress that point from the off, because it deserves to be seen, especially by ignorant people like me that make assumptions that can write off an entire genre! It is a gorgeous story, unashamedly sentimental at times in the best Capra-esque tradition and at least told in the manner of a musical, albeit without the songs; theatrical, broad themes and allowing dramatic scenes to almost become set-pieces. So it is an exuberant, almost intoxicating production. This could be a curse as much as a blessing, for despite the wonderful performance by Rani Mukherjee as Michelle, whom you importantly never feel sorry for, the central character of any biographical film is rarely an easy one for the viewer to follow. Watching Michelle deal with and conquer her disability from a child to a young, proud woman, is humbling and inspiring, but it lacks the singular purpose demanded by drama. A natural problem for any life story like this is that it has to dip in and out of the life it is most interested in, creating that frustrating set-piece style that is cathartic at best. 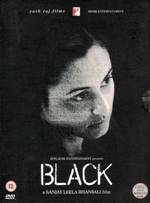 The best films of this kind find that dramatic arc elsewhere and in Black we have several, which is just brilliantly clever! It isn’t just Michelle that forms the real story, but that of the relationship with her teacher that lasts a lifetime. The film opens with an adult Michelle discovering that he has returned after a long absence, but he is suffering from Alzheimer’s. Her determination to help him reconnect with the world so he can share her success forms a focused framing device, but the bulk of the film is told in flashback as we see how he devoted his life to making her connect at all. The impressive Amitabh Bachchan grabs your attention as the larger than life teacher, Mr. Sahai, playing him like a triumphant conjurer, which suits this strange musical without music. He is a conductor in search of an orchestra! He is fantastic as he hilariously bullies the wild child Michelle into having some sort of purpose and dignity, even when her father demands he leaves. But he doesn’t stop there. Michelle becomes determined to graduate from university and he devotes his life solely to helping her do so. It is this unlikely and beautiful relationship that we can identify with more than anything and it is an exhilarating experience that I highly recommend. It becomes a love story of sorts and there is a sub-text about faith too, that Sahai at least wants his life to mean something. His lonely return despite illness at the start of the film is a touch of fantasy that asks us to believe in miracles. Of course, this is especially poetic as Michelle is a living breathing miracle herself. Director Sanjay Leela Bhansali’s inspiration was the real-life deaf-mute miracle Helen Keller, but he wisely lets the research inform the background through Mukherjee’s astonishing performance and concentrates on leaving the stage free for the double-act that is Michelle and Sahai. He makes it a very handsome film (thanks to Ravi K. Chandran’s crisp and adatable photography) with lots of details that add a little something to those performances. There’s a lovely moment where Michelle predicts rain, or where Sahai demands she walks alone and she ends up waddling with her cane past a Charlie Chaplin poster! Monty Sharma’s enchanting theme completes the spell. If I’m making it sound heavy, remember what I said at the start. It’s told in easy, broad strokes and hits the mark every time. And it’s passionately delivered, so it refuses to be ignored! In an odd way, I find myself comparing with the albeit softer The Curious Case of Benjamin Button because that was a lavishly visual biographical film about an unusual central character, but it badly needed a dependable supporting arc like that of Mr. Sahai’s. A much better comparison would be Cinema Paradiso, another film about an unusual friendship, plus a love affair with cinema, and one with a touch of fantasy here or there too. I implore you to seek it out if you enjoy Black, and vice versa of course. I'm going to have to find this. Hope you do look it up, Antares, I'd love to hear your take on it. As if anyone should need more motivation, the DVD is nicely presented with the OST included in a digipak with a cute brail cover. It's probably bad form to ask a blind person what it says, eh? I just noticed that I have two other movies by the same director and writers: Saawariya and Devdas. The first one I enjoyed but I wouldn't call it one of my favourites (I rated it ). The second one is still in my unwatched pile. It stars Shah Rukh Khan and he has won critical praise for his role.